Kyle Williams, a fan favorite throughout his 13 seasons with the Buffalo Bills, will play his last game this Sunday against the Miami Dolphins. His retirement announcement was released by the organization early Friday morning. 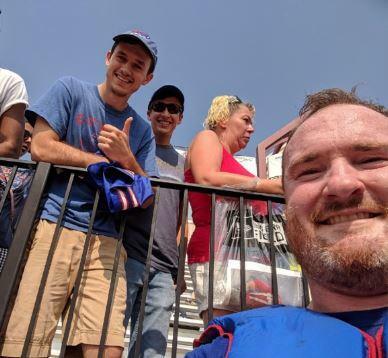 Kyle Williams enjoyed a special connection with followers of the Buffalo Bills throughout his 13-year career. This image is a selfie taken for a young Bills fan at the end of the final day of training camp this summer at St. John Fisher College. The fan is holding a replica of Williams' number 95 jersey, which the defensive tackle had just autographed. Williams' statement offered a humble self-assessment for one of the most memorable players in Buffalo Bills' history. "A singular word sticks out when I look back on my NFL career," Williams wrote. Drafted out of LSU in the fifth round of the 2006 NFL Draft, Williams exceeded expectations throughout his career by becoming a fixture at defensive tackle for the Bills and being named to several Pro Bowls. He is credited with 48.5 sacks, including five this season. He has the longest active tenure of any member of the Buffalo Bills and became a sympathetic figure as the team worked through 17 consecutive seasons without making the playoffs. It was the longest postseason drought in major professional sports until the Bills squeaked into the playoffs in a dramatic, memorable finish to the 2017 season. His statement also recalled his arrival in Western New York as a rookie at the age of 22, stating, "it didn't take me long to identify with this city, with its people, with their attitude and loyalty." "This place celebrates grit as much as it does talent. And there's something to be said for that." Williams also thanked his coach, general manager and the teams' two owners during his tenure: the Wilson and Pegula families. "I could not be more grateful to retire as a lifelong Buffalo Bill," Williams wrote in summation. "One last time, I'll see you on the field on Sunday."